Accompanying updates to Apple's line of desktops Tuesday is a new compact, wired keyboard with no numeric keypad. It's included with each new iMac by default, but can be swapped out for one that does include a numeric keypad at no additional cost when ordering online. 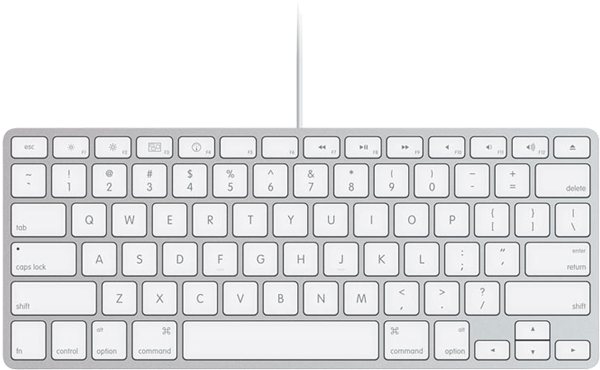 Previously Apple offered just two keyboards: the wired version known as the Apple Keyboard and the Bluetooth-connected Apple Wireless Keyboard. Today's new compact keyboard adopts an appearance similar to its wireless counterpart as both lack a numeric keypad. Both wired keyboards are flanked by USB 2.0 ports on each side. The move gives Apple customers three keyboards to choose from: a wireless model, a wired keyboard with numeric keypad or a wired "compact" keyboard sans numeric keypad. The new iMac ships with the compact wired keyboard by default, but customers can still build to order with the numeric keypad version included for no extra charge. Meanwhile, Mac mini customers can also choose any of the three keyboards in a bundle with a Mighty Mouse. Both wired keyboards come with a Mighty Mouse for $98 while the wireless keyboard is joined by the Wireless Mighty Mouse for $129. The full-size Apple Keyboard with Numeric Keypad comes standard with each new Mac Pro order, but the Cupertino-based Mac maker also offers the compact and wireless versions as swappable build-to-order options. Owners of existing Macs can spring for any of the three available keyboards at the Apple Store, where the Apple Keyboard is $49, Apple Keyboard with Numeric Keypad is also $49, and the Apple Wireless Keyboard costs $79.